Many of the present continuous type roll panel ventilators are susceptible to collapse when installed due to their manufacturing method, box-like shape and poor design characteristics. The RVP Roll Panel Ventilator has been designed with better rigidity, to avoid collapsing when installed over the insulation. 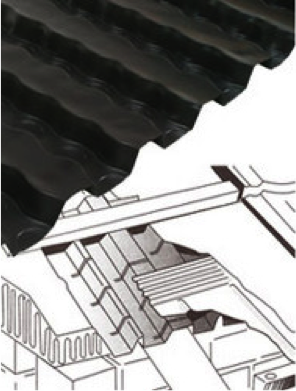 The robust sinusoidal shape of the ribs provides additional strength and ensures that when fitted over the wall plate, the ventilation to the roof space remains unobstructed. The new widths (600mm, 800mm) also ensure that when fitted with the new higher levels of insulation, the ends of the ventilators are not blocked. The Roll Out Trays will provide a clear ventilation channel above the loft insulation, and provides continuous ventilation when installed along the whole length of the eaves. Installation: The Roll Out rafter trays are positioned over the rafters, and are designed to fit rafter centres of 400mm, 450mm and 600mm. Once in position, they will provide a clear ventilation channel over the roof insulation and fixed into the rafters with corrosion resistant fixings.